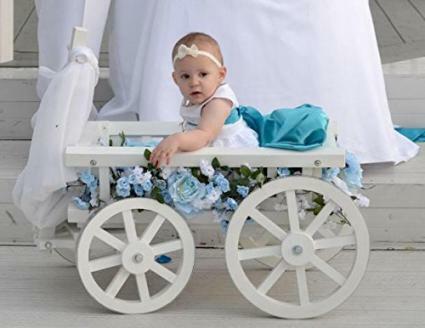 A wedding wagon for kids is a unique prop, perfect for outdoor wedding decorations. It is also a good addition to spring, summer or autumn wedding decorations. With a little creativity, a wagon can be turned into a decoration suitable for any wedding theme. Decorate the wagon according to your theme. If you want a rustic design, go for it! A more elegant wedding may call for a wagon that's a little more refined. 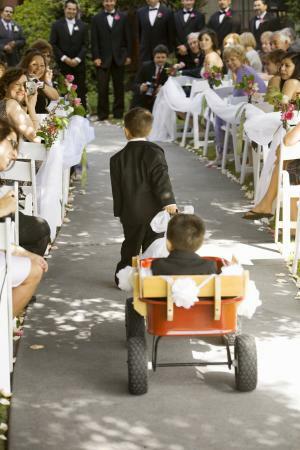 Red wagons for weddings are popular, but there are plenty of other designs you can use with kids, too. Children can ride in the wagon or they can pull it behind them with flowers and bouquets. The decision should be based on the sturdiness and safety of the wagon used, along with age of the child. 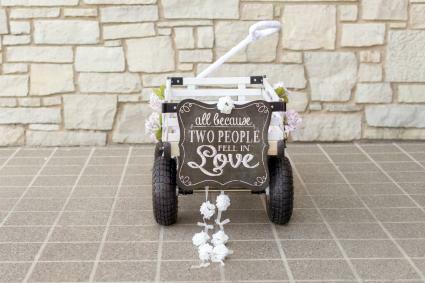 Attach a chalkboard sign that says "all because two people fell in love" to the back of a white wooden wagon. Place flowers in the side slats that match the bridal party bouquets. 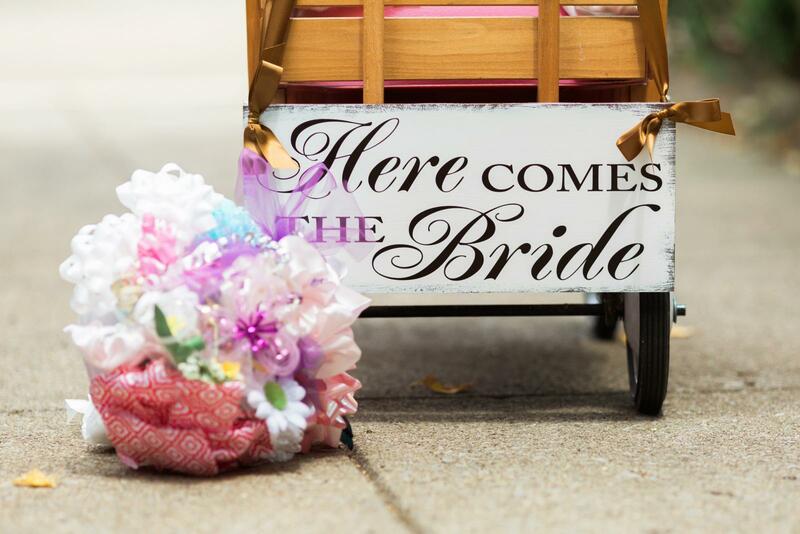 Decorative flower garlands can trail off the back of the sign to help lead the way for the bride. Cover the handle with white tulle or fabric so it matches the rest of the wagon. If the wagon is sturdy and the aisle level, an older child can pull a younger one in it. 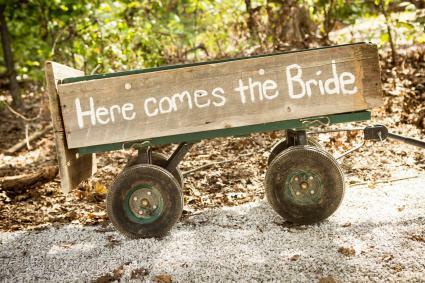 A country theme or rustic wedding calls for an unfinished wagon that will fit right into the rest of your decorations. Hand-paint your message on the side and then have the ring bearer or flower girl pull it to the front of the ceremony site to announce the bride's arrival. Don't let children sit in this wagon for safety reasons. A lightweight wagon made of plastic-coated wire is perfect for a young child to pull down the aisle. The scrollwork gives off a slightly Victorian vibe, and it's perfect for a spring or summer garden wedding. Place a few bouquets in the back that match the rest of the ceremony flowers. Make sure the one you select has wheels that turn or can be modified to turn for pulling down the aisle. Children should not ride in this style of wagon because it is not built for riding. A lovely white wagon for young flower girls is the right selection for a fairy tale, princess, or Cinderella wedding. Pad the bottom of the wagon so a young child can safely sit in it and add fabric and flowers to cover it up. Tulle can be hung from the front of the wagon. If the child is not old enough to sit up safely in the wagon, use it for photographs only and do not pull it down the aisle. Make sure wagons are safe and secure for any children riding in it. In general, preschool-age children usually have the maturity and physical ability to ride in a wagon and not climb out or fall over. If the other children in the wedding are not old enough to pull the wagon carefully, ask a junior bridesmaid or maid of honor to pull it. Use wagons that are not sturdy for decorative poses with kids in photographs. Once the kids have pulled it down the aisle, have a parent or attendant park it off to the side of the ceremony, out of the way. Decorating the wedding wagon that kids will use is something that can be finished well in advance of the wedding date. In fact, couples should get started as soon as possible on the creative wagon decorations. 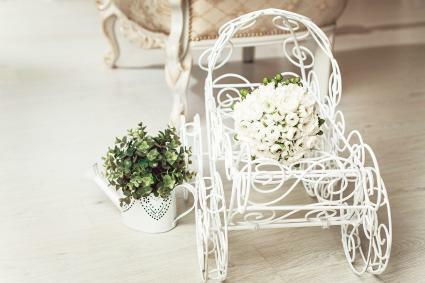 A wagon will not wilt, nor will it go bad; as soon as it is decorated, you can put it in a safe place to be stored for the wedding and cross another "to do" item off your wedding planning checklist.